A giant Chinese chemical company is betting the farm on agriculture. State-owned ChemChina said Wednesday it has offered a whopping $43 billion for the Swiss company Syngenta (SYENF), a huge global supplier of pesticides and seeds. If it goes through, the deal would be the largest overseas takeover ever carried out by a Chinese corporation, according to Dealogic, which tracks mergers and takeovers. It also raises tough questions for the major U.S. agribusiness company Monsanto (MON), whose efforts to buy Syngenta last year were rebuffed. Just two months ago, Dow Chemical and DuPont announced a $130 billion merger to create the world's largest chemical company. 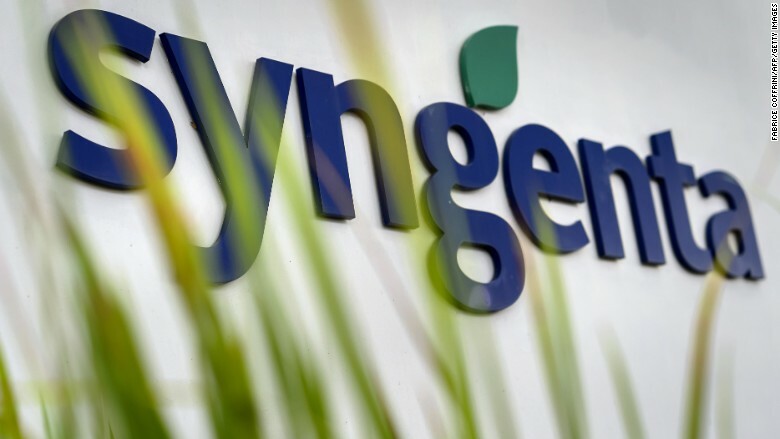 Syngenta's board has embraced ChemChina's bid and is recommending that shareholders accept the offer of $465 per ordinary share along with a special dividend of 5 Swiss francs (around $5) dependent on the deal closing. Syngenta shares surged 7% at the open in Zurich after the ChemChina bid was announced. They had already gained more than 3% a day earlier amid reports of the offer. Created 12 years ago out of a bunch of companies run by a government ministry, ChemChina has shown a strong appetite for overseas deals in Europe and beyond. Last year, it bought the Italian tire maker Pirelli for roughly $8 billion. And it announced a $1 billion deal last month for a German company that makes machinery for processing rubber and plastics. Chinese companies have been involved in a flurry of global acquisitions since the start of this year. Before Wednesday, 64 deals had been announced for a total of $20 billion, compared with 51 deals worth $5.5 billion in the same period a year earlier, according to Dealogic. The bid for Syngenta is by far the biggest so far. It's a play on the key global issue of food security -- a particular concern for China, the world's most populous country whose middle class is growing fast. More people are willing to spend more money on a higher calorie diet, which is putting extra strain on already stretched agricultural resources. China has a relatively small proportion of the world's arable land, and intensive farming has led to widespread pollution from chemical fertilizers. Syngenta has operations across the globe, including in the U.S., China and several European countries. Its pesticides and seeds, some of which are genetically modified, are aimed at helping farmers get more crops from the land they have at their disposal. But seeds have become a sensitive global issue. Last week, a Chinese citizen who had been caught digging in a field in Iowa pleaded guilty to stealing trade secrets from Monsanto and Dupont Pioneer. The man admitted to stealing valuable corn seeds and attempting to smuggle them back to China.